Guinness Cake is an Irish delicious chocolaty cake made of cacao, butter and beer. 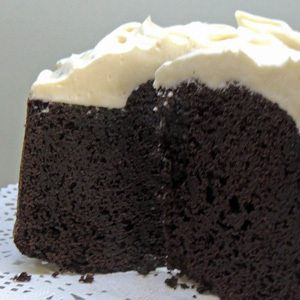 The cream cheese frosting resembles the foamy head of a glass of Guinness. In a bowl beat butter and sugar to a fluffy mixture. Add the beaten eggs and stir well. In another bowl pour the beer and add the cacao. Sift the flour, the baking powder and bicarbonate of soda and add into the butter, sugar and eggs bowl and stir very well. Add the beer with cacao and stir. Turn the dough into a greased cake tin. Bake for 50 minutes or until a toothpick inserted near the centre comes out clean. After cooking leave to stand until cool. In a large bowl whisk the cream cheese until fluffy and add the cream and the icing sugar. Ice top of cake so that it resembles the foamy pint of beer.